NUREMBERG, Germany--(BUSINESS WIRE)--EMBEDDED WORLD — Cypress Semiconductor Corp. (NASDAQ: CY), the embedded solutions leader, today announced it is sampling two low-power, dual-mode Bluetooth® 5.0 and Bluetooth Low Energy (BLE) microcontrollers (MCUs) that include support for Bluetooth mesh networking for the Internet of Things (IoT). The new CYW20819 and CYW20820 MCUs each provide simultaneous Bluetooth 5.0 audio and BLE connections, delivering low-power wireless solutions that enable music and voice commands for battery-powered fitness bands, health monitoring devices, and voice remotes. Designers can also use the solutions to develop low-cost, low-power Bluetooth mesh network devices that can communicate with each other—and with smartphones, tablets and voice-controlled home assistants—via simple, ubiquitous, and hub-free Bluetooth connectivity. The CYW20819 Bluetooth/BLE MCU has the ability to maintain Serial Port Profile (SPP) protocol connections and Bluetooth mesh connections simultaneously. 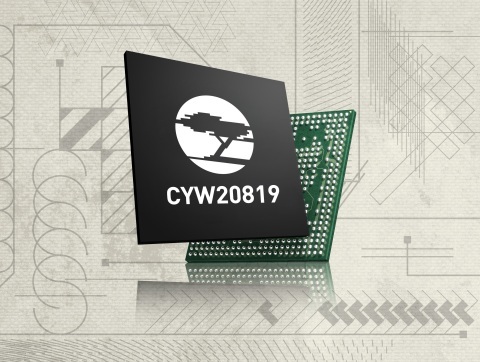 The CYW20820 offers the same features and integrates a power amplifier (PA) with up to 10dBm output power for long-range applications up to 400 meters and whole-home coverage. This provides classic Bluetooth tablet and smartphone connections while enabling a low-power, standards-compliant mesh network for sensor-based smart home or enterprise applications. The Arm® Cortex®-M4 core enables operation at 60% lower active power for connected 200ms beacons compared to current solutions—delivering up to an industry-leading 123 days of battery life from a CR2032 coin cell battery. The MCU is ideal for wearables, sensors, remote controls, smart home lighting and medical devices, and they are forward and backward compatible for dual-mode mouse and keyboard HID applications. And the Cypress Mesh Evaluation Kit (CYBT-213043-MESH), featuring a Bluetooth 5.0-qualified and regulatory-certified module based on the CYW20819 MCU for development of Bluetooth mesh applications, will be available in the second quarter of 2019. Cypress’ Bluetooth solutions share a common, widely-deployed Bluetooth stack and are supported in the latest version of Cypress’ Wireless Internet Connectivity for Embedded Devices (WICED®) software development kit (SDK), applied in the ModusToolbox suite, which streamlines the integration of wireless technologies for developers of smart home lighting and appliances, as well as healthcare applications. More information on Cypress’ wireless solutions can be found at www.cypress.com/wireless. Cypress’ ModusToolbox suite brings best-in-class connectivity, computing, security, and sensing together in a single platform. It combines the rich design resources of Cypress’ wireless libraries and the analog and digital peripheral libraries of its PSoC® microcontrollers with an open-source, Eclipse-based Integrated Design Environment (IDE). Purpose-built hardware, multi-vendor RTOS support, and standards-based security solutions provide a solid foundation, that is validated by various cloud services. ModusToolbox unifies Cypress’ offerings, providing open access to third-party solutions, and freeing engineers to focus on delivering high-value, differentiated products. The IDE is available for download at www.cypress.com/modustoolbox. Cypress Semiconductor introduced low-power, dual-mode Bluetooth 5.0 and BLE microcontrollers that include support for Bluetooth mesh networking.